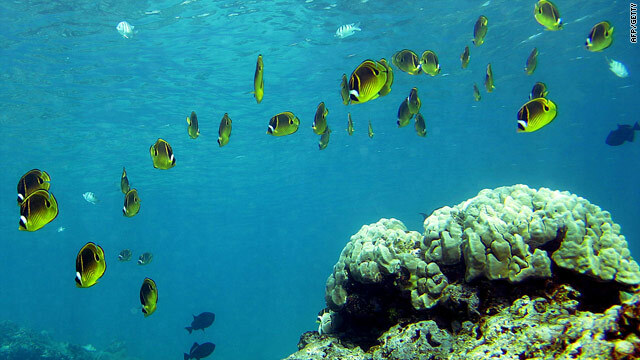 A coral reef in Honolulu, Hawaii -- we face losing entire marine ecosystems, such as coral reefs, within a single generation. Alex Rogers: "The oceans are a common heritage of mankind." London (CNN) -- Marine life is under severe threat from global warming, pollution and habitat loss, with a high risk of "major extinctions" according to a panel of experts. These are the conclusions of a distinguished group of marine scientists who met at Oxford University, England, in April to discuss the impact of human activity on the world's oceans. The meeting, led by the International Programme on the State of the Ocean (IPSO), examined the combined effects of pollution, acidification, ocean warming, over-fishing and depleting levels of oxygen in the water. The panel found that oceanic conditions are similar to those of "previous major extinctions of species in Earth's history," and that we face losing marine species and entire marine ecosystems, such as coral reefs, within a single generation. The interim report, produced in partnership with the International Union for Conservation of Nature (IUCN), was presented to the U.N. on Tuesday. The study also said that the speed of decline of marine ecosystems is faster than predicted. Alex Rogers, IPSO's scientific director, said: "The oceans are a common heritage of mankind. The extinction threat we believe is real." Rogers, professor of Conservation Biology at the Department Of Zoology, University of Oxford, told CNN: "The rate of change we are seeing in the quantities of carbon dioxide going into the atmosphere and then being absorbed into the oceans is so great that it is difficult to compare what is happening now with what has happened in the past but we do know that past disturbances in the carbon cycle have been a feature of mass extinction events." According to the panel -- which consisted of 27 marine experts from 18 organizations -- most if not all the five "global mass extinctions" in Earth's history were probably caused by the "deadly trio" of global warming, ocean acidification and lack of water oxygen or hypoxia. It states that these three factors are present in the ocean today and gives examples of marine ecosystems suffering severe disturbance, such as the mass "coral bleaching" in 1998 that killed 16% of all the world's tropical coral reefs. According to the report, over-fishing has reduced some commercial fish stocks and populations of by-catch species by more than 90%. Dan Laffoley, senior advisor on Marine Science and Conservation for IUCN, and co-author of the report, said: "The challenges for the future of the ocean are vast, but unlike previous generations we know what now needs to happen. The time to protect the blue heart of our planet is now, today and urgent." Marine scientists often describe oceans as the earth's circulatory system, performing numerous vital functions which make the planet habitable, such as creating more than half our oxygen, driving weather systems while modulating the atmosphere, as well as providing us with vital resources.